Ana holds up her shoe at the end of a previous walk. On September 17th, husband and wife duo Ana and Cary Cramer set out to walk 20 miles on Marco Island. Decked out in bright pink shirts, necklaces and a backpack with images of Ana’s sister and her mother attached to it, their mission was clear: to raise money and awareness for breast cancer. 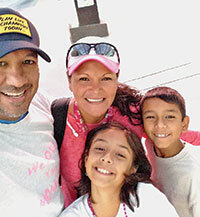 For the past four years Ana Cramer has participated in the Susan G. Komen three-day 60-mile Breast Cancer Walk. The event is a big deal for the Cramer family. Each year her husband and their two children Sidney, 11, and Matthew, 9, act as her main support system as she pushes through the many miles. Photo by Samantha HustedAna and Cary. On Ana’s backpack are images of her mother and her sister. Ana’s mother died from breast cancer, and her sister is currently in remission..
decided that if she couldn’t go to the walk she would bring the walk to her. And this time, Cary would be joining. Ana, like so many people, has personal ties to breast cancer. When she was just five-years-old she lost her mother to the disease. Her sister Virginia has also been diagnosed. Currently Virginia is in remission and is going through her last round of chemotherapy. For Ana, the 60-miles represents hope. 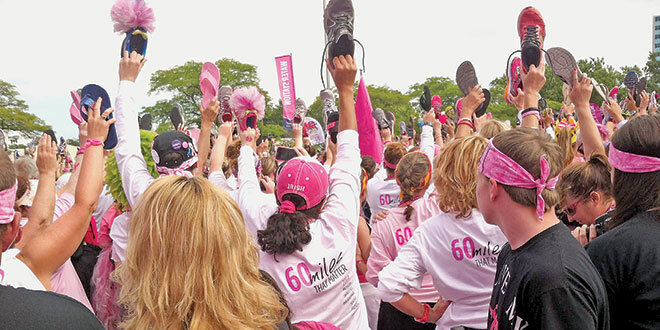 With each step she pushes towards the day when breast cancer is a thing of the past. In June the Cramer family moved from Chicago to Naples. They own a condo on Marco Island. They, like so many who came before them, vacationed on Marco and fell in love with it. Submitted Photos Ana and Cary Cramer with their two children Sidney and Matthew. Then on Sunday it was back to Naples where they walked to Delnor-Wiggins Pass State Park and around North Naples. Though the journey was filled with cramped muscles and stiff calves, it was well worth it for the two. For more information on the Susan G. Komen organization visit: www.komen.org.